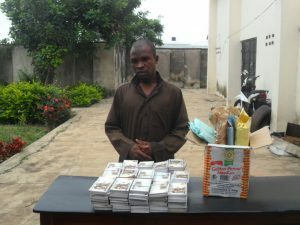 The National Drug Law Enforcement Agency in Kwara on Friday said it arrested Mohammed Adamu for possessing N9.8 million fake currency notes. The NDLEA Commander in the state, Mr Apeh Reuben, who presented the suspect to newsmen in Ilorin said the fake currency were mainly N1,000 notes,concealed the fake notes in a carton of noodles wrapped with cello tape. He said that the suspect was arrested while on transit to Kano on Aug. 9, 2016. The commander said that Adamu conspired with a yet-to-be-identified individual in Ilorin to carry out the act. “Investigation is in process aimed at arresting the accomplice,” adding that the agency was a alerting the public on the fake money in circulation. “We just want to alert the public to be aware of such fake money because if this amount of money is allowed to be injected into the economy, it is very bad. “A lay man can hardly identify that they are fake currency. These days we even have cases of people collecting money from ATM and still find fake currency in them,” he added. The suspect, who spoke to newsmen in Hausa language, admitted that the fake currency was found on him.